This page contains supporting information in relation to The Glacier Trust’s application to Innocent Foundation. Please browse our website for more information and contact us if you require further details. The Dhudhakoshi river flows south from Imja lake in eastern Nepal, just south of Mount Everest. 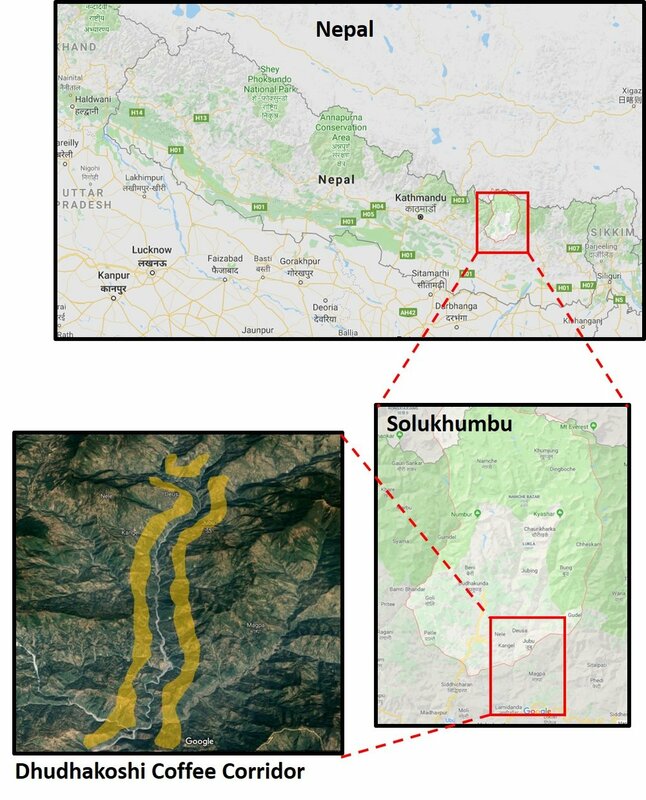 The proposed Dhudhakoshi Coffee Corridor is highlighted in yellow in the map below. More information on our pioneering work at Deusa AFRC can be found on our projects pages. The video below provides an overview of the work enabled by TGT and EcoHimal Nepal. Bishal Bhattarai, Member of House of Representatives, Federal Parliament of Nepal. Bishow Nath Niraula, Chairperson Aiselukharka Rural Municipality, Khotang. Lila Nath Niraula, Chairperson Rawa Beshi Rural Municipality, Khotang. Ashim Rai, Chairperson, Dhudkhausika Rural Municipality, Solukhumbu.